Bundesliga | Shinji Kagawa at 200: "I can't thank Borussia Dortmund enough!" Shinji Kagawa at 200: "I can't thank Borussia Dortmund enough!" 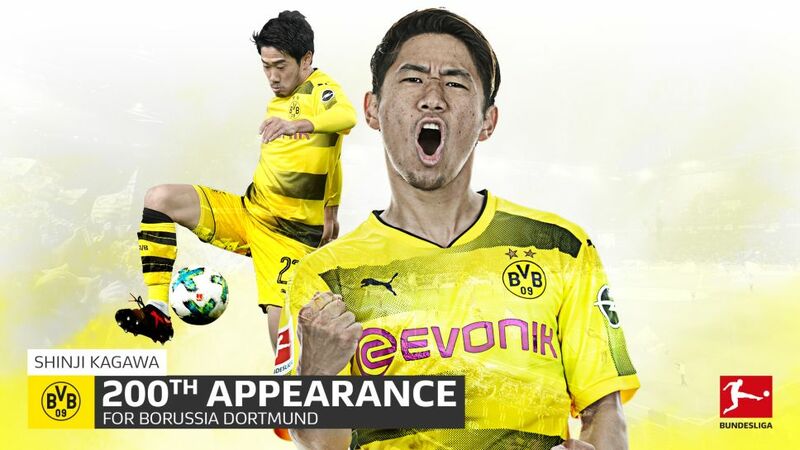 From winning back-to-back Bundesliga titles to bringing up his 200th appearance in a Borussia Dortmund shirt, Shinji Kagawa has left no stone unturned since swapping his native Japan for Germany in 2010. Quiz: How well do you know the great Shinji Kagawa? "To move from Japan directly to a club like BVB – that sort of thing doesn't happen nowadays. I'm very grateful they signed me and gave me a chance. We've won two Bundesliga titles and the DFB Cup. That was incredible. The fact the club came back for me after two years in Manchester – I can't thank them enough." "I've been here for that long already? I wasn't really aware of the numbers. It's a bit of a surprise really, but it's a nice number for me. Nevertheless, I want to keep performing as best I can and play more games for BVB." "We had a lot of success in my first season and won the league together. I've also scored in the Revierderby against Schalke (laughs). The timing was great. Everything clicked from the start. I also know that these sort of performances are expected of me. Last season we won the DFB Cup, but we have to do better in the league." "It means a lot to me, but I don't hear it so much these days (laughs). It was actually a Japanese song to start. The BVB fans took it own and made it their own. I'm really happy about it because not many players get their own songs." "I can't see me overtaking Yasuhiko Okudera (234 Bundesliga appearances). (Laughs) Two hundred and thirty-four is a massive number. That'd mean making another 100 appearances, and playing pretty much every game for the next three seasons. "I'm very proud to be the Bundesliga’s record Japanese goalscorer, but I want to and must build on it." "I can't see so far into the future. I'm delighted to be able to continue playing here. Borussia Dortmund is a massive club, but it's also my duty. BVB have to be successful. That becomes more and more apparent to be the longer I'm here and the older I get." Kazuyoshi Miura is still playing at 51 in the Japanese second division. That's a dream to still be playing as long as he's been able to. We'll have to see (laughs)." "The responsibility grows when you’re not playing well. We've also got a lot of young players, whereas I've been here a good while. Sometimes you have to help the youngsters, but I also have to improve my own game." "It enables me to help kids in difficult circumstances. That's something I've always wanted to do. It really appealed to me as a Japanese national. In my country, privileged folk engaging with those in need is nowhere near as prevalent as in Europe. Maybe I can set a good example for people in Japan." "You can't ever forget an event like that. You shouldn't forget it. I think I have a responsibility to raise awareness of problems in society. There are people in very difficult situations. A lot of people in Japan are not very aware of this. Japan is and island nation and, in this respect, is a bit sealed off from the rest of the world.I haven't been thinking so much about the attack of late, but we could have died. It's not an experience footballers are used to. I could feel the fear. But like I said, these kind of situations are commonplace in other countries – daily occurrences even. The bomb attack reminded me just how lucky my life is and how lucky I am to be able to play football professionally."